MORNING MANNA : Dec 12 - DESTROY NOT YOUR FOUNDATION! Dec 12 - DESTROY NOT YOUR FOUNDATION! “If the foundations be destroyed, what can the righteous do?” (Psa 11:3). Our covenants form the foundation of our spiritual building. Our spiritual life can be built up as New Jerusalem only if we stand on our covenants. When you break your covenant with God, you are breaking the very foundation of your spiritual building. 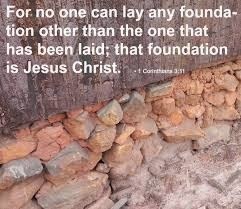 Not only our foundations with God, but also the apostolic servants of God, form the foundation of our building. “Ye are… built upon the foundation of the apostles and prophets, Jesus Christ himself being the chief corner stone; in Whom all the building fitly framed together growth unto an holy temple in the Lord” (Eph 2:19-21). Many want to be independent and do not want to be built upon the foundation of the apostolic doctrines. Some, though they stand with the servants of God, are often offended with them in most trivial matters. If you are thus offended, remember, you are offended with the foundation stone. And if you are offended, or removed from the foundation stone, your life can never be built up. How can the building be built without the foundation stone? This is the reason why many believers who often get offended with servants of God do not prosper in their spiritual life. Therefore child of God, decide to stand with the servants of God forgiving and forgetting all the grieving factors. “Esteem them very highly in love for their work’s sake” (I Thess 5:13). If you do so, the Lord will start a new life in you, and in the long run, you will be found as New Jerusalem, the Bride of Christ.